Boulder, CO – Computer model weather forecasts are often wrong. They give a great “guess” about how the weather patterns behave, but like people they can sometimes have a bias.nA known bias is that these models are too fast and too weak with cut-off storms along the West Coast. Cut-off storms break away from the jet stream and tend to “hang out” south of the main storm track for a few days. Often the computer models forecast these storms to be weaker and faster than they really area. Said another way, whenever I see a cut-off storm in the computer model forecast, I always think to myself that this storm will move more slowly and drop further south than the models predict. This is exactly what happened overe the weekend as the image below shows. The actual weather for Friday, April 8th is shown on the right side. The five-day forecast for this date made on April 3rd was too fast and too weak with the storm. On the left side (the five-day forecast), I drew a dashed red line showing the center of the storm. On the right side (the actual weather), I drew a solid red line showing the center of the storm. Notice how the actual center of the storm (solid red line) is about 200 miles further west than the forecast (dashed red line)? Yup, the storm was slower than the models thought it would be. This always happens. Also, the deep shades of blue show the strength of the storm. 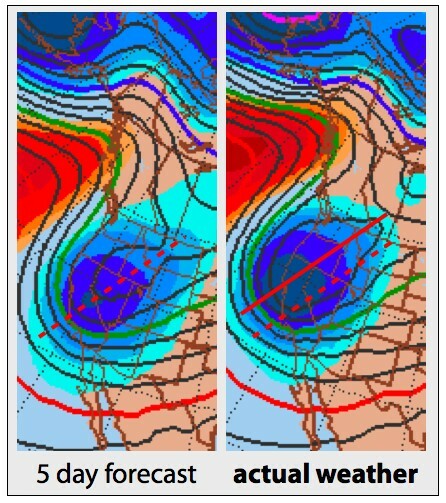 Notice how the actual storm (on the right) has deeper blue shading than the five-day forecast on the left. Again, the storm was stronger than forecast. And again, this always happens. Weather computer model forecasts are amazing, but as a human forecaster, I need to know that the models are sometimes biased and adjust my forecasts accordingly.